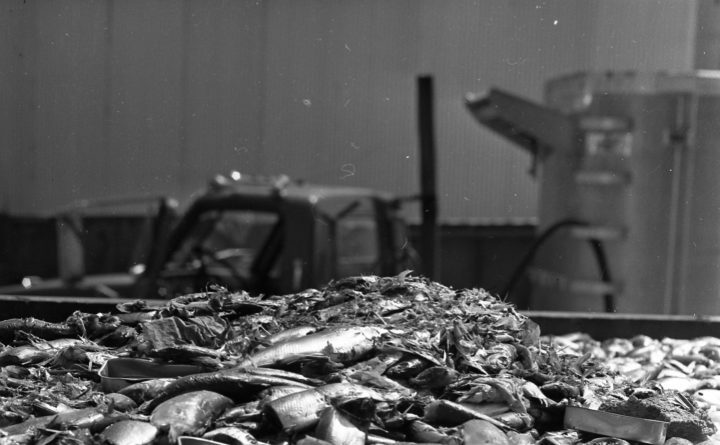 Fish remnants and sardine cans sit in a dumpster at the former SeaPro Inc. fish rendering plant in Rockland in this 1974 photo. A truck used to transport fish remnants from sardine processors sits at the former SeaPro Inc. fish rendering plant in Rockland. 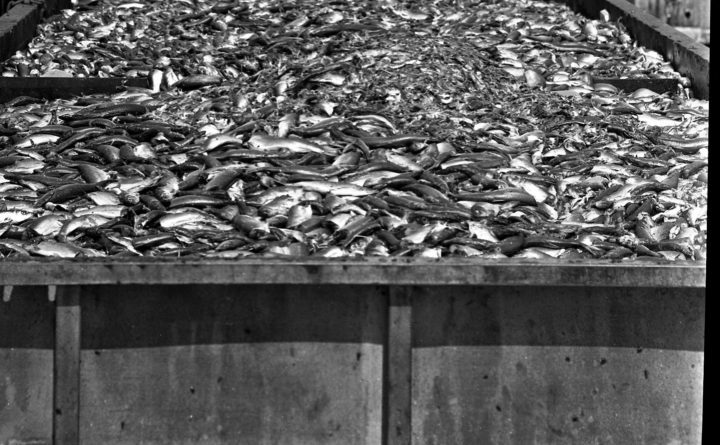 The former SeaPro Inc. fish rendering plant in Rockland would take leftover fish waste from sardine canneries and other fish processors in Maine and render the remnants into fish meal and fish oil. But if Rockland is relatively new to you, the saying might not make sense. The occasional whiff of bait? Definitely. But today, Rockland is arguably no smellier than any other coastal city with a working waterfront. 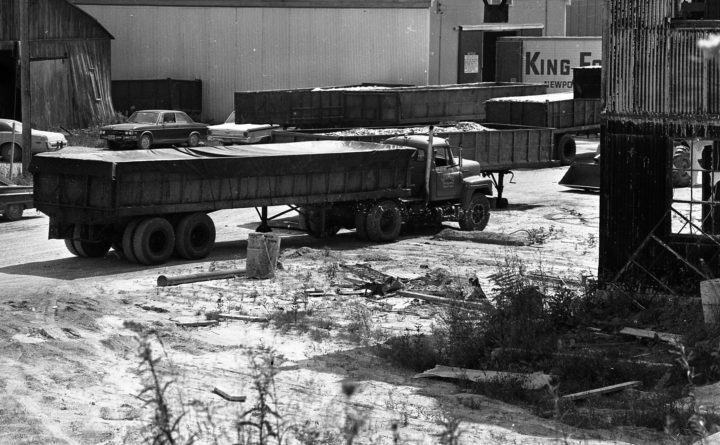 Just a few decades ago, Rockland was known for the smell of rotting fish. The harbor was flagged in yachting magazines as a place to avoid, and residents were victims of the direction the wind was blowing on a given day. But in 1988, the city took a big step forward in shedding its stinky reputation, when the source of the smell, SeaPro Inc. — a fish waste rendering plant on the waterfront of the city’s north end — closed its doors. SeaPro’s closing helped bring an end to the immediate odor problem, but it was also a sign of a larger economic and cultural shift occurring not just in Rockland but in other coastal cities, such as Belfast, where traditional industries faded as the tourism economy grew. SeaPro opened in 1959 and was once seen as a valuable cog in the fishing industry that thrived on Rockland’s waterfront. The plant rendered herring remnants into fish meal and fish oil. When it closed for good in 1988, SeaPro was the last fish rendering plant in the Northeast, according to a 1987 New York Times story. SeaPro purchased herring remnants from numerous sardine canning plants along the Maine coast, from Bath to Southwest Harbor, according to a 1978 Maine Sea Grant report on Maine’s harbors and related businesses. The remnants were cooked and then put through a centrifuge, where the oil and solids were separated. The solids were then dried and ground into fish meal, which was then sold mainly as poultry rations — most of which went up the coast to Belfast to support its once booming poultry industry. The oil was sold to out-of-state businesses that used the product for tanning leather, making rust-proof paint and as a lubricant, according to the Maine Sea Grant report. But unfortunately for Rockland residents, strong fish odors were a byproduct of the process. Fred Carey, who managed the plant for five years in the 1970s, said the company “bent over backward” to minimize the smell. Attempts to quell the smell included closing windows and doors and adding filters, according to the 1987 New York Times report. SeaPro would conduct its fish rendering roughly from May to November, Carey said. For five or six days a week, the plant was running around the clock cooking the discarded pieces of fish. And this wasn’t fresh fish. During the 20th century, fish processing was a huge part of Rockland’s economy, with numerous processors and canning facilities calling the city home. “We were always used to the smell,” Tom Molloy, a former mayor and Rockland city councilor, said. Molloy said he remembers complaints in the 1960s about the smells emitting from SeaPro being particularly bad. SeaPro’s owners, a Houston-based company called Zapata Corp., said it would work to control the odors, Molloy said, but it was never controlled to a tolerable level. In the late 1980s, the tide started to turn against SeaPro as fish processing faced declines and residents banded together to say they were done putting up with the smell. “Rockland was changing, and it was changing quickly,” Carey said. Peabody and his family moved onto Cedar Street, just upwind of the SeaPro plant, in 1985. Around that time, Rockland was very different place than it is today. “It wasn’t a pretty picture, and it’s such a wonderful community with so much potential,” Peabody said. Many Main Street storefronts were boarded up, the fish sludge on the harbor kept away pleasure boaters and Rockland boasted one of the state’s highest crime rates. Tourists would come to the city’s flagship event, the Maine Lobster Festival, during which SeaPro would suspend its fish rendering, Peabody said. But other than that, Rockland was a pass-through town for visitors trying to get to Camden or Bar Harbor. Peabody worked for the city as an assessor before leaving the public sector to start his own real estate appraisal company. He and his neighbors talked about the smell from SeaPro and complained about having to live with it. Around 1987, the informal private complaints morphed into a group called the Clean Air Action Committee. “Our goal was not to close SeaPro. That was never the goal. The goal was to make them good corporate neighbors,” Peabody said. The group wanted three things. First, to bring publicity to the economic detriment SeaPro was causing the city. Second, to get the local chamber of commerce to back its position. And finally, to get the City Council to force Zapata to do something about the smells caused by SeaPro. There were signs against SeaPro in people’s yard and at City Council meetings. But some in the city worried that forcing SeaPro to address the smell or closing the plant would hurt the local economy and leave people jobless. In the 1970s, according to the Maine Sea Grant report, SeaPro employed about 16 full-time employees and between 20 and 30 part-time employees. It’s not clear exactly how many people were working at the plant when it closed, but Peabody estimated it was fewer than the number of people who worked there in previous decades. In 1987, the Rockland City Council approved placing a referendum question on the November ballot asking residents if they would favor the council taking “all necessary actions” to force SeaPro to eliminate the odors “even if it means closing the plant,” according to Bangor Daily News archives. Rockland voters approved the referendum and elected Peabody to the city council. “Incumbents and SeaPro lose big at Rockland,” read a headline in the Nov. 4, 1987, Bangor Daily News. Even Molloy, who was wary of the economic impact closing SeaPro would have, began to see whatever economic benefit the plant brought to Rockland was not worth the rest of the city living in stink. Lawsuits the city brought against Zapata were dropped when the company announced it would be closing SeaPro in 1988. In the end, it would be too costly for Zapata to implement measures that would control the odors. The sardine and fish processing industry had been declining since the 1970s, Molloy said. Rockland was trying to bolster its tourism economy and focus on bringing businesses to its industrial park. When the plant closed, Molloy said there was not much of an economic impact on the city. Without the rotten fish smell, the city could move forward in working on making Rockland not only a place where people want to visit, but a place where residents can breathe easily and enjoy a better quality of life. Slowly, the city of 7,000 started to change. The Farnsworth Museum, which had been in Rockland since the 1940s, began to draw artists and galleries to the city. Then came the restaurants and downtown shops. Now, 30 years later, the city is discussing how it should handle cruise ships wanting to bring thousands of people into its harbor.